I sleep in yet again this morning to 8:45AM, but it doesn’t matter since today is a sea day. After getting cleaned up a bit, I wander down to the dining room for breakfast: ordering a cappuccino to start, have some fruit, yogurt, pastries and a pancake. 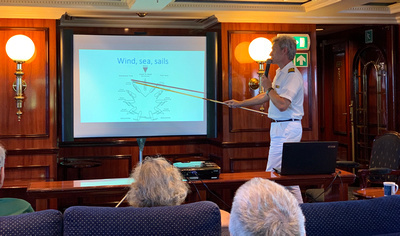 The captain gives an interesting presentation this morning titled “Everything”, which covers the questions posed to him from passengers over the last few days: sailing ship configurations, navigation and GPS, and the physics of how to sail ships with sails. Amazingly, he has written a PhD on using Super-cavitation for fast underwater propulsion – a subject I knew nothing about! Our course is 090 due east with a stiff wind on our nose, so no sails are set today. We pass by Puerto Rico this afternoon, so I turn off my cellular data roaming, since I don’t have a roaming plan for the US, only the other Caribbean islands. Lunch is served on deck from the Tropical Bar. It was quite a spread…it took the staff an hour to haul everything up from the kitchen to serve to us. They work hard, and for long hours! My cabin steward gets some time off in the afternoon. I attend a presentation given by a passenger this afternoon which profiles his working life aboard the Union Castle Line on the Royal Mail route between London and South Africa. It was somewhat interesting to see glimpses of life at sea in the 1950s and 60s for the passengers. The wind is strong and it’s also hot outside this afternoon, so I stay in the Piano Bar working on my journal and photos while sipping a cappuccino. Later in the afternoon the clouds come in, making it more pleasant outside as the sun sets. I join a table for eight for dinner this evening: five from the UK and two from Canada (Sidney, BC, but former Brits). I have a bunch of Internet time to use, so this evening I work on my photos and manage to post a new album to Facebook. 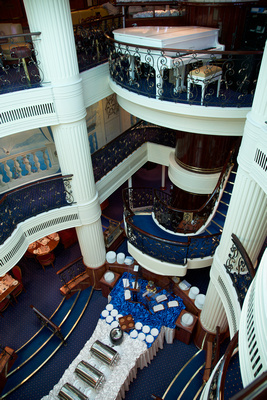 This entry was posted in Caribbean and tagged cruise, sailing ship, ship. Bookmark the permalink.